Leslie Jamison’s The Recovering is self-aware about being the same old story, recalling the redemption narratives of Rousseau and St. Augustine. 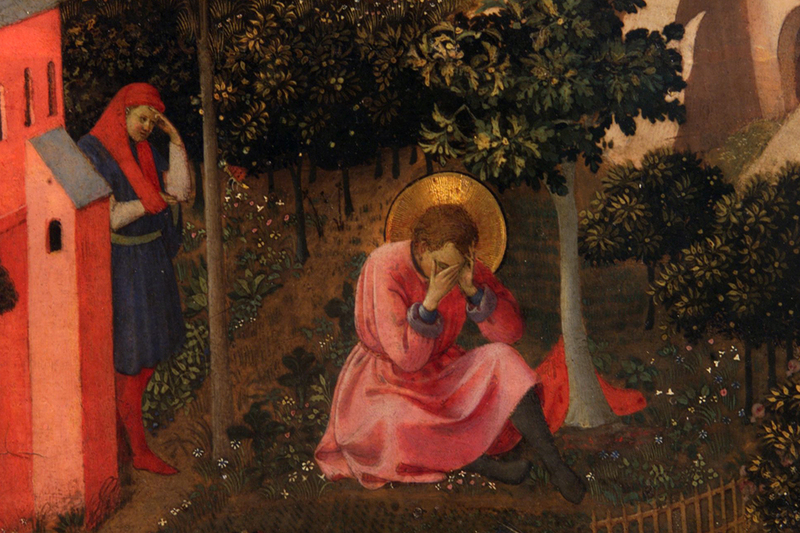 Augustine weeps beneath a pear tree. A selection from La conversion de Saint Augustin. Although marked by hyperawareness and a tendency to tell the stories of others, Leslie Jamison’s The Recovering: Intoxication and its Aftermath nevertheless follows a simple formula. Subject drinks until her life is out of control; subject realizes she has to change or hits bottom; subject quits drinking and becomes a functioning member of society. Such books are also called redemption memoirs, and their confessional nature harkens back to Rousseau’s Confessions and the Confessions of St. Augustine (whether either of these two men were indeed redeemed at the end of their books is debatable). The more direct ancestor of addiction memoirs is Thomas De Quincey’s Confessions of an Opium Addict, a chronicle of a habitual and unrepentant addict. Like William Burroughs’s twentieth century update of De Quincey, Junky, the desire for redemption is squashed by the need for the drug. Jamison uses Burroughs and De Quincey along with a lot of other dissolute drunk writers, including short story writer Raymond Carver, Charles Jackson (author of the alcoholic classic The Lost Weekend), poet John Berryman, and novelists Malcolm Lowry and Jean Rhys, to tell her own story of struggling with alcoholism. The recovery narrative has become the bestselling form of autobiography. Should we be surprised when redemption and confession steal the limelight in a tradition whose origins are copyrighted by Augustine and Rousseau? Using Joan Didion’s memoir on grief, The Year of Magical Thinking, as an example, Miller also argues that “the female autobiographical self comes into writing, goes public with private feelings, through a significant relationship to an other. Feminist critics have been making the case for the model of the relational self at the autobiographical project for over two decades” (emphasis supplied). Miller’s essay was published in 2007, so we can go ahead and make that three decades of relational selfhood. Jamison has tried to answer the question why society still treats addicts as moral failures. What Miller does not describe is who the other is in an addiction memoir: Is it the sober self, the one who never tried drugs or alcohol? Or is it the addict who has successfully recovered? In Didion’s book, the other is clear: her recently deceased husband, John Gregory Dunne. But Jamison is wilier than Didion, and her project is broader: Although she definitely “goes public with private feelings,” she also interrogates the addiction memoir as a genre by writing one that frustrates the simple expectations of readers. This is, yes, a book about abusing alcohol, joining AA, and going to 12-step meetings, and, to a lesser extent, Jamison trying to discern the desires that made her an alcoholic. That’s all standard and expected. But Jamison has also written a book about many addicts and their strategies for recovery, the stories they tell. She has tried to answer the question why society still treats addicts as moral failures. Ours was a familiar scene: plastic folding chairs, Styrofoam cups of coffee gone lukewarm, phone numbers exchanged. Before the meeting, I had imagined what might happen after it was done: People would compliment my story or the way I’d told it, and I’d demur, Well, I’m a writer, shrugging, trying not to make too big a deal out of it. Jamison’s book, however, is far from it. Not just the part about her drinking—there is an unmistakably prurient appeal to addiction memoirs—but as she learns the lessons that will help her to stop drinking, the reader learns more about the addiction memoir in general. Jamison continuously critiques others’ stories while describing the pitfalls of her own recovery. It’s worthwhile to pause on that boring, however, as there is a sameness to these stories. Which part of the story brings the reader more delight: The messed-up drug-and-drinking years or the clear voice of the recovered addict, sometimes tinged with moralism? What Alexander begins to realize, or at least frames as a realization for his article, is that these sober men aren’t telling their stories as performance pieces—to play the part of feckless dilettantes or sanctimonious altruists. They’re offering their stories as cures, for other people and themselves. Jamison grapples throughout the book with the question whether stories can cure us. As she weaves in the stories of other writer’s recoveries (or refusals, as Rhys never really sought treatment for her drinking), Jamison is enacting a more-is-better approach. Although her book is not at all pedantic or preachy, she advocates for recovery in all of its messiness and complexity. She does so explicitly and implicitly, telling her story and folding in the stories of other people who’ve succumbed to addiction. Writers with little or no previous claim on public attention have become an identifiable neoconservative brand by reviving key elements of American autobiographical narrative for new audiences, reawakening national fantasies of individualism, and promoting more normativities in life narrative that displace histories of racial and gendered violence with tales of individual hardship and redemption. The redemption narrative thus both forms the storyline of the memoir and structures how the scandals that come after will be read; namely, by casting two newly wounded protagonists—the writer who now suffers the humiliation of public exposure, and the reading public whose collective good faith has been dealt a blow—who overcome their pain as they perform anew the redemption narrative. Jamison’s story is, by this definition, not quite an American neoconfessional. As far as we know, it is true. What she tells us about her own disease and the incidents she shares from the recurring characters in her book like Jackson, Rhys, and Berryman are all, we assume, well-documented. The prime example of the American neoconfessional as Gilmore describes it above is James Frey’s A Million Little Pieces, a book initially marketed as memoir and then re-categorized as fiction after Frey admitted he’d fabricated significant aspects of his story. Jamison, though she loosely follows the dissolution-and-realization arc, weaves the stories of others into hers at every point. She has not written a typical addiction memoir; rather, she has written a book that embraces many counternarratives, both those of famous writers and those of the ordinary people she meets during her rocky recovery. Rather than shutting down the discussion of how addiction works and how recovery functions, Jamison opens them up. In her afterword, she suggests medications like methadone and Suboxone (both prescribed to opioid addicts) to aid in recovery along with the structure of 12-step meetings. As the “This is boring!” incident demonstrates, Jamison is painfully self-conscious of how stale addicts’ stories can become. She writes: “But the accusation of sameness, just another addiction memoir, gets turned on its head by recovery—where a story’s sameness is precisely why it should be told. Your story is only useful because others have lived it and will live it again.” That idea is the engine of The Recovering: not that it’s the most original or dramatic or nightmarish story of addiction ever told, but that it is just one among many. In embracing this idea of the multiplicity of addiction memoirs, Jamison’s book resolutely succeeds, both by giving Jamison the space to tell her story and by encouraging her to find kinship with the stories of others. 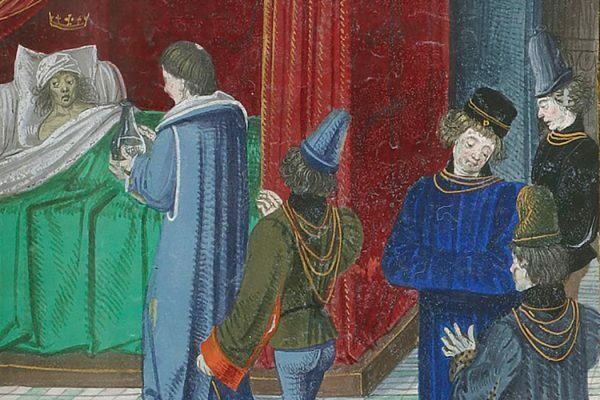 King Charles VI of France was the most exalted representative of a rash of "Glass Men," who appeared throughout Europe between the 15th and 17th centuries.